After operating for twenty years, Mistura is successful. Yet, Paolo Paolini knows the importance of continuously evolving the restaurant to appeal to generations to come. Born in Italy and immigrating to Canada when he was seven, his passion for food began at 15 when he first started working in the food industry. Years later, he opened his first restaurant, Splendido, a place that I still consider the best brunching experience in the city. He’s careful to create an elegant environment at Mistura without becoming pretentious; it’s important for customers to feel comfortable. 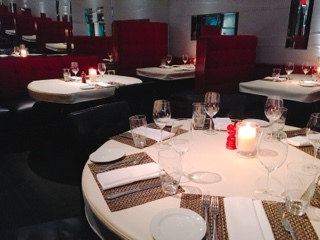 Walking into their spacious dining room, you get that feeling. Everything looks opulent but it’s not stuffy – classic white linens are replaced with lux cream leather and candles joined by airy lighting fixtures. With a new Executive Chef commanding the kitchen, Klaus Rohrich is putting a modern flare on the traditional Italian favourites without giving up the practice of using seasonal Canadian ingredients. 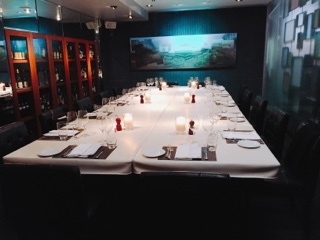 To showcase their fall menu, a group of food lovers were invited into the restaurant to try a selection of items. Accordingly, most dishes pictured in the post are smaller than actual portion sizes. 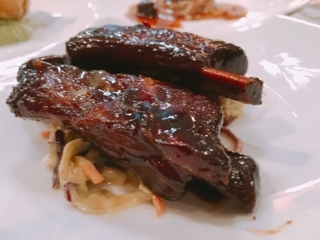 Rohrich has previously served as Mistura’s Sous Chef for six years, so he’s no stranger to the establishment’s beloved dishes, like the balsamic glazed lamb ribs ($34), which will always have a home on the menu. After marinating the lamb for three days and slow cooking for a few hours, you can imagine how tender the meat becomes. Yet, the preparation doesn’t render the meat tasteless; you’re not going to mistake these for pork ribs. The light gaminess of the lamb is still prevalent but balanced by the sweet and tangy glaze thickly slathered on top. Donning a Blue Jays cap, Rohrich is laid back and casual – he jokes, he’s straight forward, and he doesn’t mind revealing how dishes are created. What truly shines through is his love for cooking and experimenting in the kitchen. Paolini believes in giving Chefs the freedom to create – when Klaus wanted to make charcuterie (difficult and time consuming items) he obliged and will soon even convert a wine display to showcase these meaty creations. Available in two ounce servings, diners can combine the charcuterie from the six options to create their own platter (ranging from $8 for the mortadella to $50 for the bellota pata negra also known as ibérico ham). 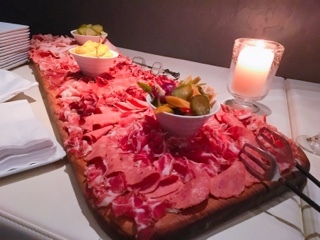 Rohrich shows restraint with the spices, the prosciutto di parma ($18) wasn’t overly salty. In his hands, the mortadella creamy and light. Even the house preserved pickled vegetables are deliciously tangy and crunchy. Through trial and error he discovers new ways to heighten existing dishes. While trying to keep pasta fresh for the evening, he vacuum packed the dough and found that in the process the air pockets were removed and helped keep the dough al dante. The wild boar angolotti ($21) has an ultra-thin crust encasing a decent portion of braised meat. The thick glossy roasting jus on top is rich without relying on salt. 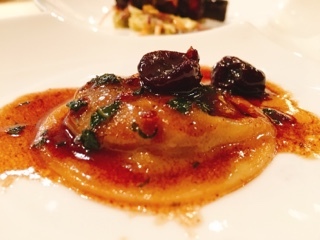 The port stewed dried cherries are not for me, but for those who find the angolotti heavy on its own, does help lighten the dish. In the end, Paolini explains it best: people should visit Mistura to enjoy dishes that can’t be easily replicated at home. The meals take time to prepare – it’s not just a piece of meat seared on high heat and finished in the oven or something deep fried until golden. Take their boneless free range chicken ($29), the name sounds boring even though it’s anything but. 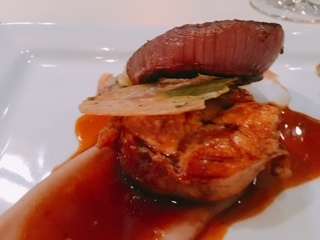 The de-boned chicken is prepared ballotine style with the white meat encasing dark. After being slowly cooked sous vide the meat’s moist and flavourful with a crispy piece of skin included for crunch. If you’re not in the mood for a traditional main, one can easily be filled with a selection of their appetizers. Arriving two pieces in an order, the crostini are satisfying delicious. 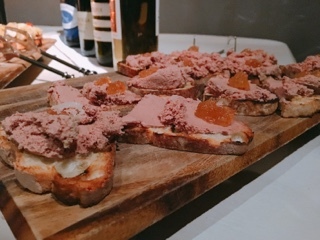 The marinated eggplant with fresh herbs ($6) is the lightest of the bunch while the duck liver pâté ($10) luscious and rich with a bit of sweetness from the mostarda on top. 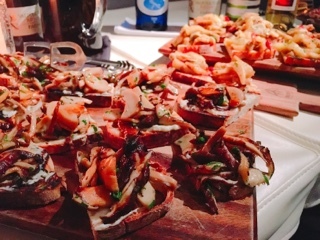 My favourite crostini was the warm mushroom and gorgonzola ($8), so comforting and the mild blue cheese not overly strong rather adding a creamy touch. 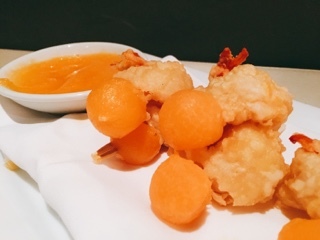 Much too easy to munch on, the crispy shrimp ($18) are tempura battered skewers with compressed melon. Perfect for nibbling on while enjoying a glass of Prosecco, you normally wouldn’t picture shrimp and cantaloupe together but the touch of acidity in the citrus dip helps balance out the melon’s sweetness. Oh how I love artichokes and to have it deep fried ($16) at Mistura is a rare treat. 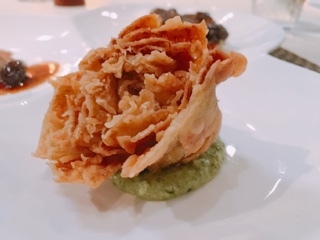 The outer edges are feathery and crispy while the heart remains juicy and soft. The creamy herb sauce has a big punch of lemon in it to lighten the dish, while the gherkins and capers gives the condiment a tartar sauce flair. The artichokes pair well with the sweet corn soup ($12), thick and creamy, relying little on cream and instead puréed corn. 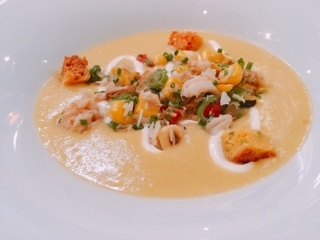 The crunchy croutons could be smaller so you don’t feel like you’re getting a huge mouthful of it, but the crab and roasted onion salsa is fantastic, adding a hint of heat and keeps the soup savoury. Chef Rohrich imparts some words of wisdom: you cook with your ears and all the senses. Being a chef is knowing how to adapt to changes so that you can’t rely on a recipe. 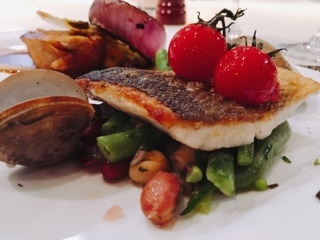 I can see this craft in the pan seared branzino filet ($32), you’ll need to know how long to keep the fish in the pan so that the skin is golden and crispy but still have the meat flakey. There’s so much going on with the sides for the branzino - steamed Manila clams and vibrant olive oil poached cherry tomatoes. Although, it’s the lemon scented bean salad that’s the highlight: instead of a soggy stew, each ingredient is distinctly represented and the green string beans still have bite. 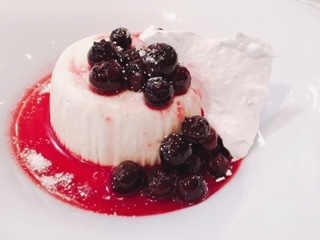 All too often panna cotta, a famous Italian dessert, arrives tasting like milk jello. 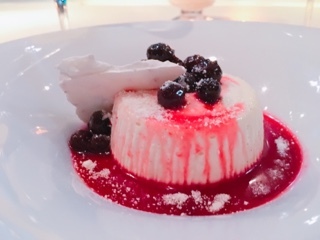 At Mistura, their vanilla panna cotta ($12) is one of the better ones I’ve tasted – there’s an airiness that makes the creamy dessert feel smooth and luscious. The plump blueberries on top were a good choice, but the lemon used in the meringue could be toned down as it renders it bitter. If you ever see Paolo wandering around the dining room, you’d be lucky to have him sit down at the table. He’s a no BS type of a guy and could regale you for hours with stories from working in the industry … I don’t want to spoil his own Kitchen Confidential that needs to be written, but there was an incident with a gun and telephone. Mistura isn’t flashy and doesn’t try too hard to fit into what’s “trendy”. Paolo simply states that the restaurant isn’t about fluff, you’re not going to get “tweezer” food here. Being a millennial, albeit on the cusp of the Gen X designation, I’m tired of going to restaurants that want to target this broad generation. I hate sitting on backless wooden stools and don’t even get me started on the dreaded communal tables. Sometimes I’m in the mood for sharing plates, but what’s wrong with getting your own main that includes all the sides once in a while? Yet the one thing that drives me insane? The loud music. Why does anyone think I want to visit a restaurant so that I need to desperately scream over the music (and everyone else screaming) to speak to my dinner guests? At Mistura, thankfully, it’s blissfully tranquil.